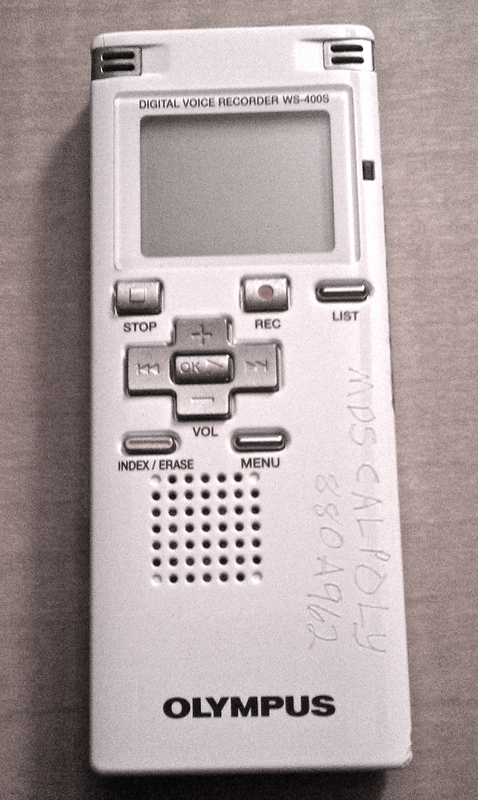 Vuvox for my French project…take a look! This project doesn’t have to do anything with the food on campus, but I used vuvox and wanted to share :)! Winter quarter went by so fast! I cannot believe it is the end, and finals are already next week. As I was trying to come up with a really interesting story or news to write about for my final project, a fellow student in my Journalism 285 class mentioned the Organic Farm on campus. The Farm is really pretty when the weather permits. On the way there, the views were so amazing!! 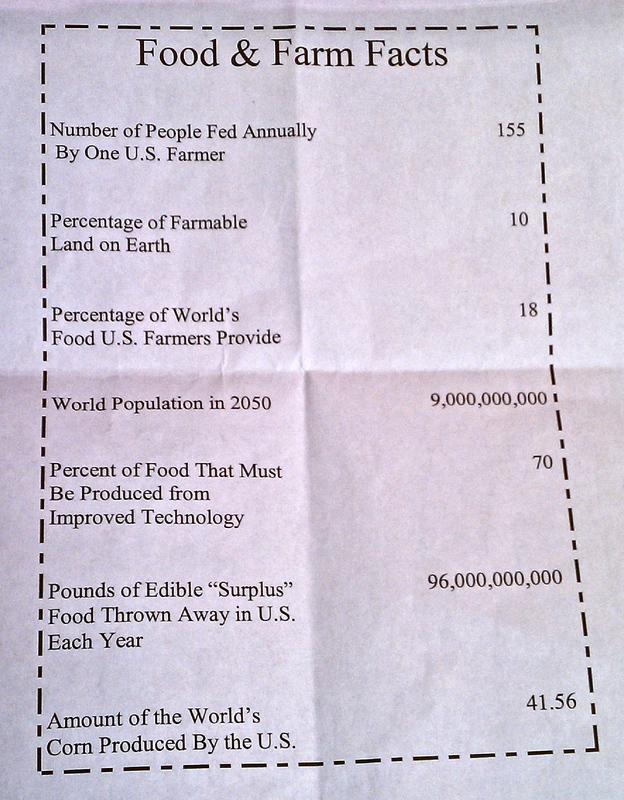 I heard about the Organic Farm through Hope Hanselman. She is in my multimedia journalism class, and told me her and her roommate order produce from the Organic Farm. 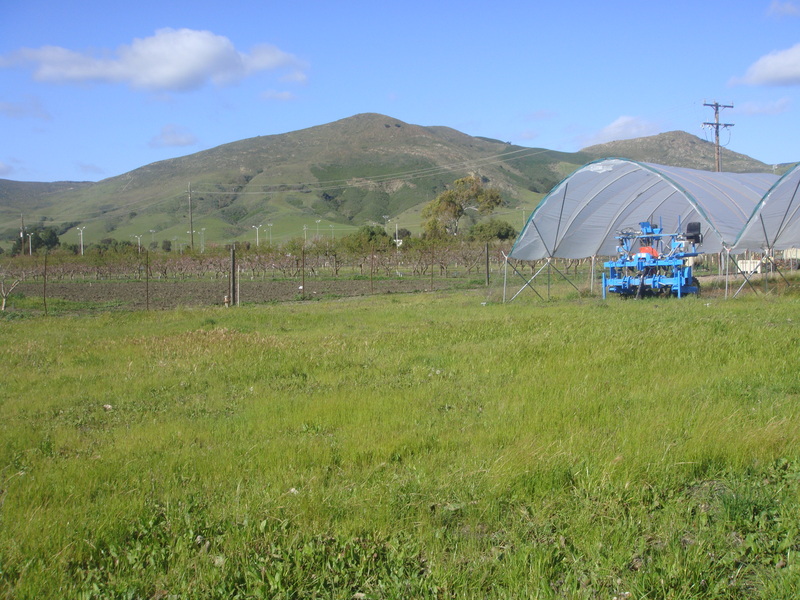 I decided to research more about the Organic Farm because I never knew it existed, and thought it was perfect for my last assignment! Thanks so much for tuning into my blog these past 9-10 weeks! Hopefully I will add new content during spring quarter! Everyone has their favorite spot to go when they’re hungry on campus. Restaurants on campus and around the UU are always packed with students around 11 a.m. and later for dinner around 6 p.m.
A great place to eat if you are looking for a good sandwich is Dexter Subs & More. It is not in the UU but next to the Art Building and Dexter Lawn. Dexter Subs & More offers sandwiches, smoothies, salads and also has value meals which saves you dollar. Dexter Subs is personally one of my favorite places to go for lunch, and my friends in the dorms love it! The smoothies and sandwiches are really tasty, and it’s convenient to get Value Meal #3: half sandwich, smoothie, and chips for $7.00. The downside is that Dexter Subs does not take meals so you have to use your plus dollars each time. Another student who loves Dexter Subs is Laura Neylan. “Specifically, I like the roasted turkey sandwich at Dexter Subs,” said Neylan. She also prefers to use her plus dollars buying food and drinks at Jamba Juice in Poly Canyon and at Lucy’s Juice next door to Sandwich Factory. Liberal Studies major, Laura Olson, thinks Campus Dining can definitely improve but has a couple favorite places to eat around campus. “I like the sandwiches at VG’s! They have this really good pesto mayo in it,” said Olson. One of Olson’s favorite things to get for dinner is the soup. She said it is really good, and her favorite is the vegetarian chili. 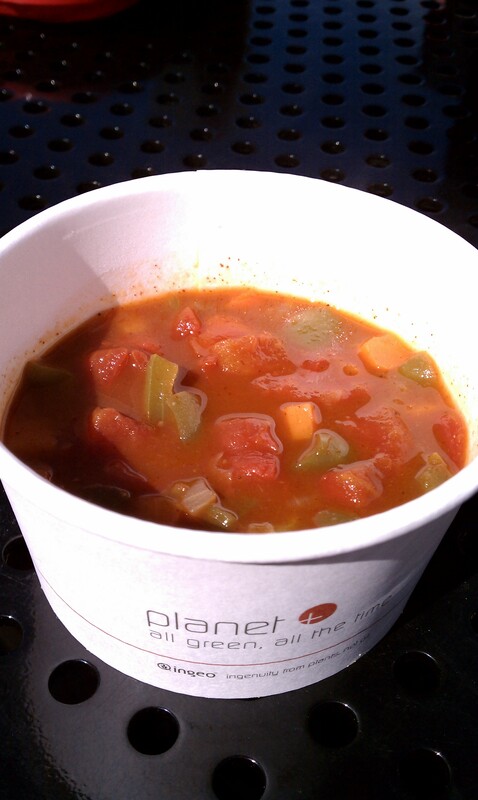 The Avenue, VG's, 19 Metro Station and Sandwich Factory all offer a soup of the day. One of Laura Olson's favorites is the chili pictured above. The sandwiches on campus seem to be popular among most students, but do you dare try the ethnic food on campus? Apparently, it’s not bad! Metro offers a Pan-Asian station which offers dishes such as imperial beef, orange chicken, chow mein and stir fry vegetables on a daily basis. Another place you can find asian food at is VG’s. I’ve heard students enjoy the fried rice bar which is offered in the middle of the week. The workers cook it to order which is impressive, but slow. First year Jordan Mason said he enjoys the fried rice dinner at VG’s the most. “I also like the pepperoni or BBQ chicken pizza from BackStage, and the turkey sandwiches from Sandwich Factory.” said Mason. Check out the restaurants mentioned above and see for yourself if they’re really good! Early morning classes and late night studying can make it difficult to eat healthy. Loading up your dorm room with healthy foods is the perfect way to get in a healthy snack or meal when necessary. The University of North Carolina at Chapel Hill has some helpful ideas for healthy snacking. Here are some healthy snacking options for your dorm room. 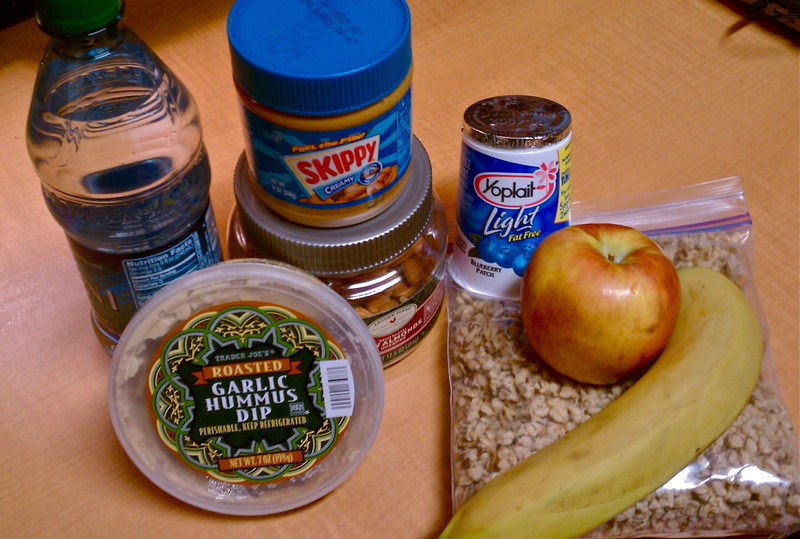 From left to right: bottled water, hummus, raw almonds, peanut butter, yogurt, granola, and fruit. As I was sitting in my room thinking about this post, I was wondering if other students cared about what snacks they stalk up on for their dorm rooms. I asked a first year student student who happens to be switching her major to nutrition, and a second year who lived in the dorms last year, and is now living in Poly Canyon Village. Poly Canyon Village is the new apartment development on campus students can apply to live in their second year. Derek Koehler lived in the dorms last year, and is now residing in Poly Canyon Village (PCV). In the dorms, Koehler said Chewy bars and Capri Suns were at hand for his morning classes. He also kept Easy Mac (instant macaroni and cheese), a bag of baby carrots, healthy dressing for salads, and a case of water in his dorm room. Koehler’s go-to food: Kiwi-Strawberry Snapple and orange Tic Tacs. Now in PCV, Derek said he cooks more now that he and his suite mates have their own kitchen, where he makes steak and eggs. It is not difficult to keep healthy snacks in your room. You can go to the supermarket and buy healthy food, go to the campus market or village market in PCV, or even use your meal plan to buy things like the fruit and vegetable cups or yogurt. Yukie Nishinaga is the Cal Poly Corporation’s Marketing and PR Manager. I first contacted Campus Dining by email, and asked to speak with a chef or whoever would agree to meet with me. Campus Dining referred me to Nishinaga who is the Marketing and PR Manager as I said before, and I asked her if she could answer a few questions for me. I emailed her times I was free to meet on a couple days of the week. Unfortunately, the interview was conducted by email only. Q. What’s your policy when people get sick? Q. Is there a popular item students favor or tend to buy most of at VG’s and/or Metro? A. In this order: breafast burrito, turkey ranch sub, dinner comfort food, fresh salads, and the pasta bar. Q. How come dining is at certain hours for each meal and how come we can’t use more than one meal at a time? Q. What are your nutrition standards? Are there health measures or regulations you abide by? Q. How is the pasta cooked? Who cooks the seafood and meat? Are the vegetables fresh? A. We cook the majority of our food in large kettles. Our pasta is cooked in water then cooled with ice. Unfortunately Nishinaga did not respond back to the question about what their policy is when people get sick, and how come dining is at certain hours and we can’t use more than one meal at a time. Tonight's dinner at VG's Cafe looked more appealing and tasted better than previously before. 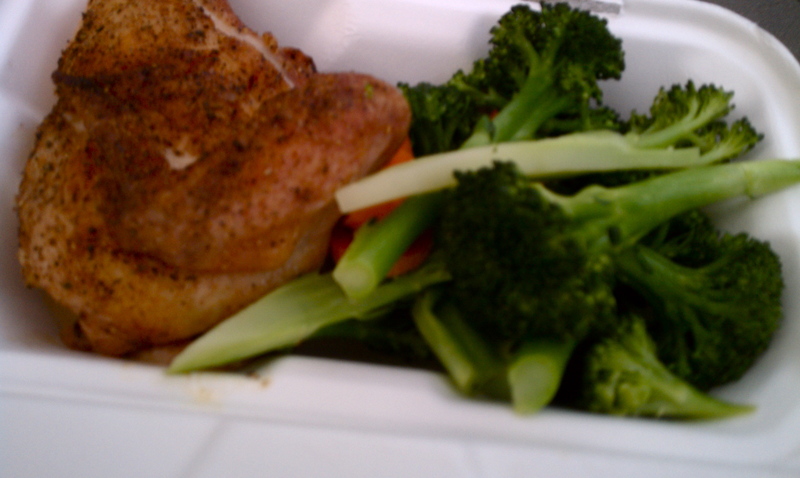 I had the grilled chicken and steamed vegetables. Let me know if there’s something you want to hear about!! If you despise dining in the campus restaurants, an alternative option is cooking in your dorm kitchens! It can be easy, fast, and at a low price. My roommates and I were tired of always getting food at VG’s or Metro, so we decided to test out the kitchen one night. Homemade popcorn! All you need are popcorn kernels, oil, and a pot with a lid. 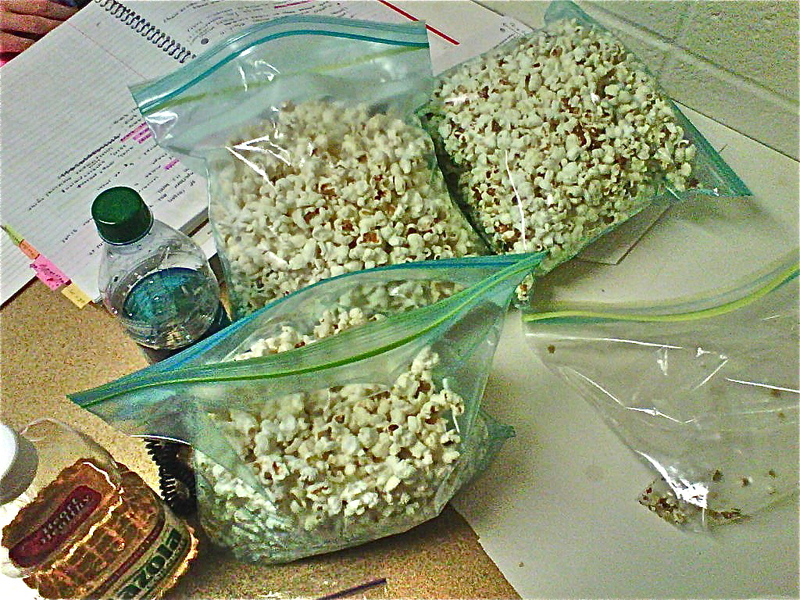 We made a lot of popcorn which can be a healthy snack (homemade), and is easy to make! We only ran into two problems. One, the kitchen didn’t have any pots with proper lids, so we had to improvise and use another pot as a lid. Second of all, the fan didn’t work. It was getting a little stuffy in the kitchen so we turned on the stove fan. All it did was spread oil around the room which irritated our eyes. The kitchens for the most part are perfect for a break from campus dining. I have seen residents baking, cooking, and storing things for later in the large refrigerator/freezer. Today was Valentine’s Day, and a lot of students wanted to make it special for others. First years J.J. Grube, Kelsey Kiley, and one of their friends decided to bake cookies for one of their friends in the dorms. 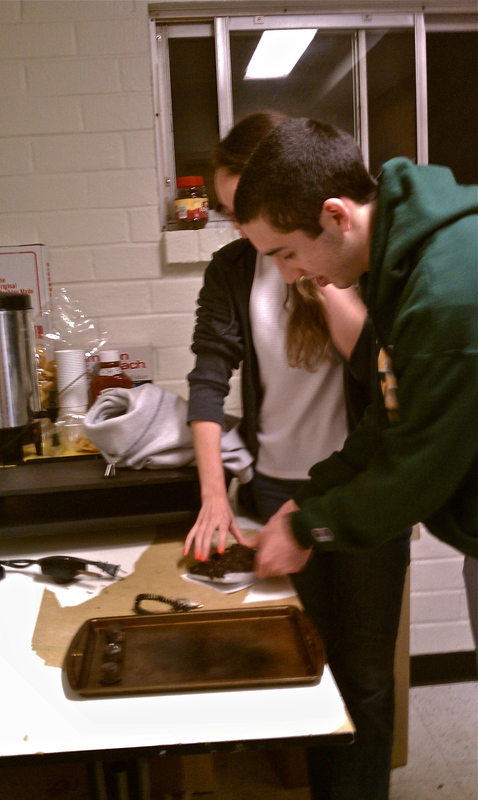 Kelsey Kiley and J.J. Grube baking cookies. The trio went to the Campus Market and bought some “break and bake” cookies. Immaculate Brand cookies from the Campus Market. Baking with cookie dough like this is so simple anyone is capable of doing it. It’s literally just placing it on the cookie sheet and it’s ready to bake. 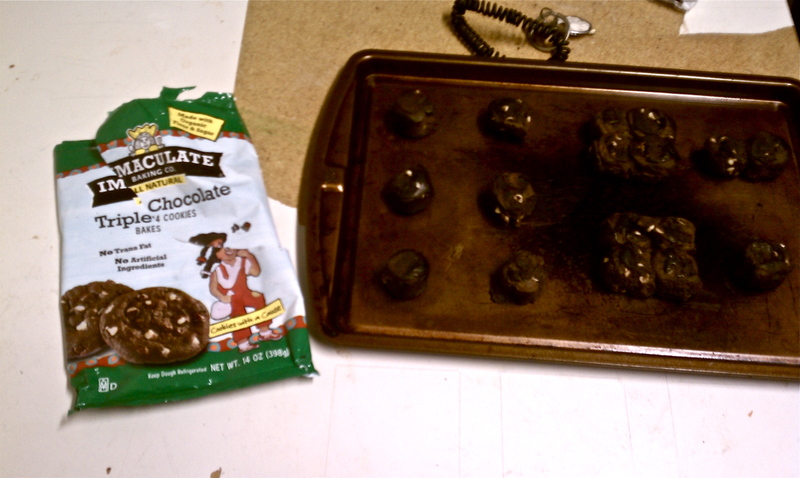 Other ideas to consider besides baking cookies are baking cupcakes, cooking pasta, heating up soup from a can, or making popcorn like I attempted to. I asked Kelsey Kiley and J.J. Grube if they had any ideas or suggestions on how to improve Campus Dining. Kelsey and J.J. both said campus restaurants need VARIETY! “I feel like I can only have pasta, a sandwich, or a salad. They need more variety each night and within each station. If they switched it up it would be better,” said Kiley. Grube said he doesn’t like how we have a certain number of meals assigned to us, and each meal has a certain price limit. In addition to that, not every place takes meals. If the dining restaurants were to just take money you wouldn’t have to count meals, and it would give more variety. Would you like to have unlimited meals everyday?